From Traverse City to Detroit, Michigan State Police and agents of the state’s medical marijuana regulatory agency have this week been acting to shut down non-compliant cannabis-based businesses. The action comes in the form of Cease and Desist letters directing targeted companies to halt operations or face lawsuit. “Field personnel from the Bureau of Medical Marihuana Facilities Licensing Division Enforcement Section – accompanied by a Michigan State Police trooper – have begun physically serving cease and desist letters to marihuana businesses that are not in compliance with Emergency Rule 19,” said David Harns, Public Information Officer, Department of Licensing and Regulatory Affairs, in a communication with The Social Revolution. The action comes after last month’s expiration of a crucial deadline for existing industry compliance with the state’s new Medical Marihuana Facilities Licensing Act program. The MMFLA will launch a new, regulated medical marijuana business marketplace in 2018 which will replace the existing, grey-market business community. The newly-created Bureau of Medical Marihuana Regulation created a pathway for these centers to continue to operate and serve patients while their applications were being reviewed. Application processes for the new program began December 15, 2017. On February 15, 2018, existing businesses were required to submit an application and an all-important attestation E letter from their city; that letter certifies the existing cannabis business is in compliance with local ordinance regulations. Businesses who failed to obtain the letter, or who have not begun the applications process, are not in compliance with the state’s regulations and are subject to closure under the authority of the MMFLA. According to eyewitness reports from those who experienced being served with the letter, the LARA agents involved cited a “list” of companies the state believes are operating in violation of the Emergency Rule 19 requirements. 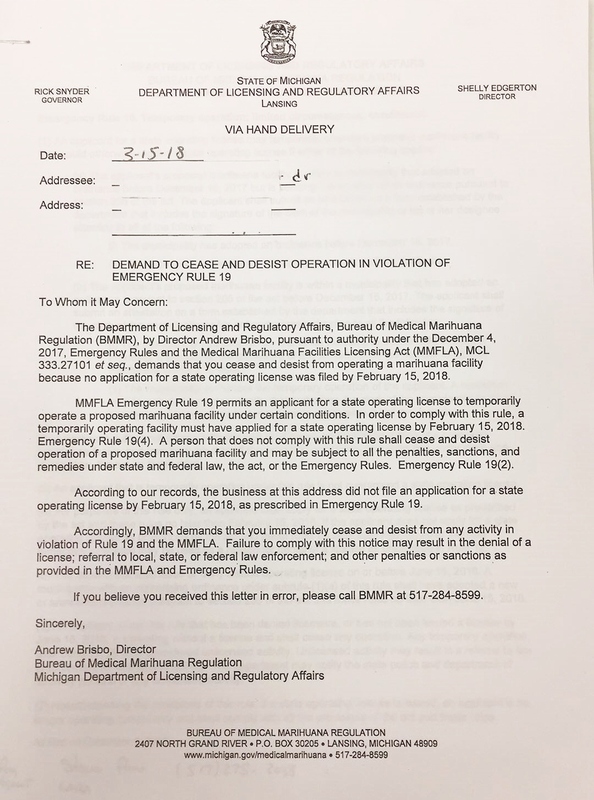 This week’s first round of Cease and Desist letters is the beginning of the end for many Michigan businesses in the five industries regulated by the MMFLA program: cannabis cultivation, processing, transportation, testing and retail sale. A meeting of the Licensing Board is scheduled for later this month; media reports have stated LARA anticipates issuing the first round of MMFLA licenses in April. You can view a copy of the cease and desist letter at this link here.